The prices of rawhide and skins have dropped significantly this year as a section of tanners and traders were reluctant to raise its prices. Many believe the government's announcement on keeping its prices unchanged is one of the key reasons behind the fall in the prices of rawhide and skins. The prices should be increased by at least 5.0 per cent considering the average inflation rate, they added. The prices of rawhide, if the market forces work, will be higher as hide traders believe that the number of sacrificial animals was at least 10 per cent lower this year compared to than that of last year due to floods and non-availability of cattle in many parts of the country a day before Eid-ul-Azha. Dr Khandker Golam Moazzem, an economist at the Centre for Policy Dialogue (CPD), told the FE that the market is not working properly as the government wants to control it. He said the people remained in the dark about the demand for cattle and its supply. The average prices of rawhide of large-sized cattle ranged from Tk 800 to Tk 900 per piece. The average prices of rawhide of small-sized cattle were around Tk 500-Tk 600 a piece. The prices of cattle increased by at least 15 per cent this year than that of last year. On the other hand, seasonal traders sold those hides between Tk 1,000 and Tk 1,200 a piece at Posta in the city, people involved with the trade told the FE. However, the number of seasonal traders declined this year than that of last year. Tanners collect rawhide and skins one or two weeks after Eid-ul-Azha and for the time being, they usually preserve them with salt at hide-hubs in different areas of the country. They said they would buy salted-hides even at higher prices than that of the government-set prices, depending on their quality. Md. Shakawat Ullah, secretary of Bangladesh Tanners' Association (BTA), told the FE that they would purchase high quality of hides even at higher prices. "We will definitely offer even 5-10 per cent higher prices on government prices depending on the quality of hides," he said. Mr Shakawat said the prices of rawhide and skins in local areas were low adding, "We have no mechanism to control the seasonal traders." Md Tipu Sultan, a hide trader and proprietor of Bengal Leather Complex at the city's old part, told the FE that they are yet to collect hides at their expected level. According to their estimation, the tanners will collect hides worth around Tk 5.0 billion this year. He said the demand for leathers and leather goods remained low in the international market especially in Europe. Hazi Md. Delwar Hossain, president of Bangladesh Hide and Skin Merchants Association, predicted that supply of rawhides and skins might be low following a fall in the number of sacrificial animals. Around 7.0 million cattle and goats were sacrificed during Eid-ul-Azha last year. About 5.0 million cattle were slaughtered last year apart from around 2.0 million goats, buffalos and other animals, according to finished leather and leather goods and footwear exporters association. Md. Mizanur Rahman, treasurer of Bangladesh Tanners Association, said Janata Bank which usually invests the largest amount of money for hide purchase did not disburse their special loan this year. The tanners believe that the state-owned bank did not disburse fund this year as many tanners failed to repay their loans. The government had fixed the prices of rawhide of sacrificial animals at Tk 55 a square feet for cowhides while Tk 22 per sq ft for goatskin. Tanners said they have purchased a big sized rawhide (20 to 22 feet) between Tk 1,200 and Tk 1,300 (Tk 50 to Tk 55 per sq ft). A large volume of rawhides is collected during Eid-ul-Azha when hundreds of animals are sacrificed. Tanners argue that this year a 72-kg sack of salt was sold at around Tk 1,700 on the occasion of Eid-ul-Azha which was normally sold at around Tk 1,200. The country needs over 1.5 million tonnes of salt annually against the total production of over 1.3 million tonnes. 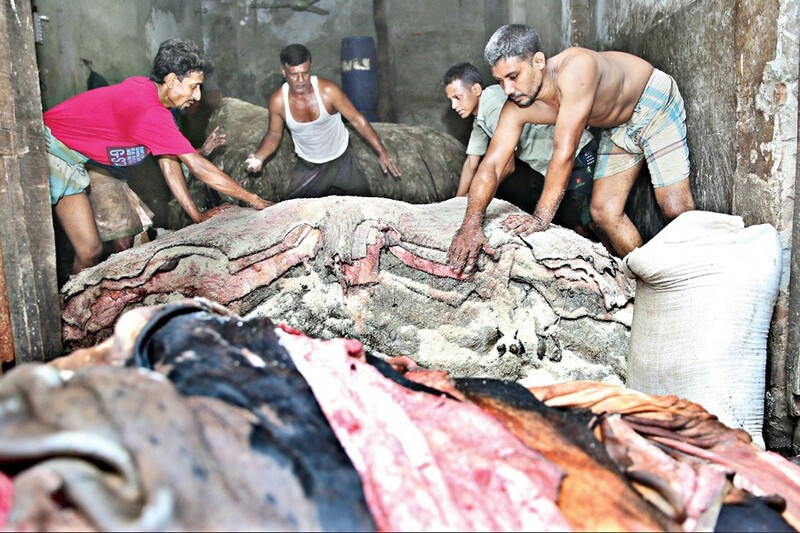 Mr Sultan said there was no coordination among the Bangladesh Finished Leather, Leather-goods, and Footwear Exporters Association (BFLLFEA), Bangladesh Tanners Association (BTA) and Bangladesh Hide and Skin Merchants Association (BHSMA) for collecting rawhide. "I sold a big-sized rawhide at only Tk 1,000 but I expected to get at least Tk 1,500," Md Haroon, a small trader who came from Shanir Akra of the capital told the FE at Posta in Lalbagh in the city on Monday. However, the government kept the prices of rawhide and skins as same as the previous year citing the relocation cost of tanneries. Since 2013, the traders cut the prices of rawhide of sacrificial animals every year up to the year 2016 in the name of fall in the prices on the international market and high relocation cost of tanneries. In the years 2011 and 2012, tanners did not set the prices of rawhide of sacrificial animals and the then market price of cowhide was Tk 110-Tk 120 a sq ft across the country.